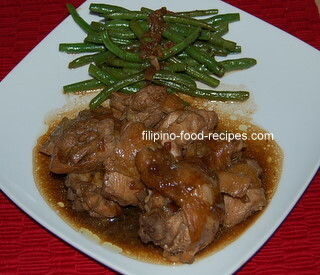 This chicken adobo Filipino recipe is simply chicken stewed in vinegar, soy sauce, garlic, bay leaf and peppercorns. 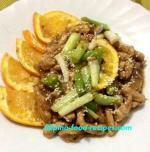 It has the same procedure as the Pork Adobo. Though unlike the Pork dish, I like to marinate the chicken first so it can absorb the flavor better before cooking. cooking until the sauce has dried up and almost fried, then serving with Garlic Fried Rice and Fried Egg. Doing a mix of Chicken and Pork Adobo. 1 Mix the pork, vinegar, soy sauce, bay leaf, half the garlic and onion and peppercorns in a container and marinate for 20-30 minutes. 2 In a medium pot, put the marinade together with the chicken and bring to a boil. DO NOT STIR. 3 Simmer for 20 minutes or until chicken pieces are tender. Add the water in if it's drying out before the meat gets tender. 4 (Optional) To cook your favorite veggies, either spinach, green beans, or asparagus as a side dish : leave a little sauce on the pan and add a little oil. Stir-fry the desired vegetable for 2 minutes, then add a 2 tablespoons water, cover, and cook for another 2-3 minutes. Traditionally done with 'Datu Puti' vinegar, a real tangy, sour vinegar, but if that is a little overpowering for you, substitute half the vinegar with water. Remember that chicken breasts or the white meat cook faster than the rest of the chicken and can tend to be rubbery and bland when overcooked, so if you plan to have a fork-tender dark meat, scoop out the breast before cooking the rest further. If you are to try the variant dish with the coconut milk and all you have is the prepared or canned coco milk, read the label to make sure there's no sugar added, you might not like the hint of sweetness for this savory dish.